Luoyang Jujia Hostel is worth your stay,Jujia(居家）means 'home' in chinese。It is a home-stay hostel，It is a real community alley in a chinese Way,It has only 4 room small in the hostel. 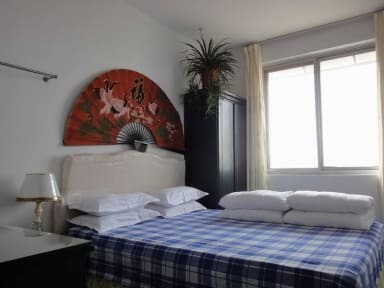 If you book a room, you have a true Chinese home. It is the best place for the traveller to feel one kind of daily family activity;You can experience real life of the Chinese. Bedroom are neat and comfortable and have Satellite TV. Moreover there is free laundry, hot shower, Internet access, Kitchen facility and so on. But the most important aspect is that we are very friendly, hospitable, and are eager to make your stay in Luoyang as enjoyable as possible. We will pick you up at the train or bus station and will recommend the best places to eat with inside secrets that only a native of Luoyang can provide. The Shaolin Temple, Longmen Caves, and White Horse temple are beautiful places. We are Good enough to help you,can assist with planning, And help to buy a train or plane tickets. From the Hostel there are many bus connection,No.27 go to the Airport in Luoyang (15km). No.29 go to the Longmen caves(13km),No.21 go to the Old City(10km). Go to Shaolin Temple(78km). The owner of the hostel is super nice and will ensure that you have a great visit. I arrived rather late at night and Ken took me out to get food and beer! It was also fun talking to him in English and Chinese. He helped me a lot by providing bus and tourist information. The neighborhood is not in a touristy part of town and older, which I consider a plus as you can interact with ordinary chinese people. Luoyang is not famous for it's city center which is why I chose to stay at this place. By bus you can still get to the city center in a half hour for just 1 RMB (+ all the major attractions are accessable by bus from this hostel). It is very clean & the best part is that it has a kitchen for me to cook my own meals. In about a 4 minute walk, there is a very large supermarket near the bus stop to buy interesting ingredients to cook with. The host is very nice & will advise how to save money. It's more like Airbnb, than hostel. It has rooms, and shared bathroom. Don't let the location scare you a bit, it's good neighbourhood. The host is a great man. He waited me on two occasions on the bus stop to guide me to the building (once when I came to Luoyang, and other time when I got lost in the city :)). is ok with english language and is willing to help with all things you need. Definitely recommend this place. The apartment was nice, and the guy who runs it is nice. Although, his English was limited. He was helpful though. Not really a place to make new friends and mingle with people, but if you want a quiet place then this is ok. The owner is an incredible person! While we were staying with him he had a fractured hip but still waited on us tirelessly and helped us get to wherever we wanted to go. The rooms were very clean and the beds very comfortable. The only downside to the guesthouse was its location. It was near a bus stop but to get to the main sites of the city like the Longmen Grottoes it often took over an hour. There are some great street food stalls near the hostel that offer great breakfasts. I had a great time at Luoyang Jujia mainly thanks to Kim. 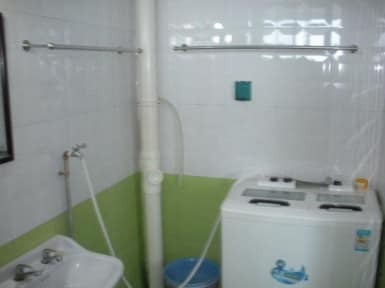 The hostel is clean and whilst it is difficult to find, the taxi fare is so cheap in Luoyang that it almost doesn't matter. Kim also happily showed me the best and most cost efficient places to eat and will take you to the nearest bus stop, all within close distance to the hostel on his Moto. Apart from being a great host Kim is also a fantastic human being and will go out of his way to help make your stay amazing. Thanks Kim! This is a mans flat (ken) where he lives. Just like airbnb. Not in tourist area. Make sure you take down mobile number for taxi to ring as it's hard to find as it's top floor of a block of flats in a poor area. Ken was a brilliant host- would do anything for you and was happy to help. Showed us to the supermarket, booked taxis for us, taught us Chinese, gave info. We were able to use his kitchen. He really is a lovely man, his English good and if not he used translate. Treated us like kings! Host helpful and friendly. Internet connection well. Hostel is a private apartment located in a living area, thus very hard to find without the owner's help and Chinese knowledge. I was fetched by the owner, who was willing to wait for me a long time. Due to construction works, a big part of public transportation had been rendered inaccessible, therefore not the best infrastructural network, but not a far ride to the centre of the town (about half an hour altogether). I cannot fault Ken, he was such a lovely guy meeting us at the train station and taking the bus with us back to his and helping my partner carry our bags, but... The area he lives in just did not feel safe, a run down area and quite poverty stricken from the looks of it. Would not recommend if solo travelling! Personally, it shouldnt be defined as a hostel, it's a guesthouse. It's his spare room. Ken himself was great, but felt unnerved throughout our stay due to the location.